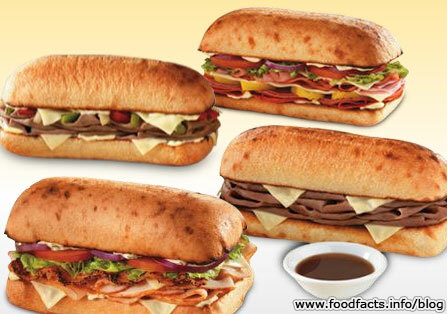 Arby's has introduced Toasted Subs to their Market Fresh sandwich line-up. There are 4 Toasted Subs: the French Dip & Swiss Toasted Sub, the Philly Beef Toasted Sub, the Classic Italian Toasted Sub, and the Turkey Bacon Club. As part of the Toasted Sub announcement, Arby's Chief Marketing Officer, Cheryl Barre, said: "The majority of fast food restaurants that serve subs don’t have our combination of two things – high quality, fresh ingredients and the added convenience of not having to get out of your car – the drive-thru." The subs will be advertised with a new "I'm Thinking Arby's" television campaign. The Philly Beef Toasted Sub (pictured top left) features roast beef, melted Swiss cheese, roasted onions, green and red bell peppers and roasted garlic sauce on a toasted ciabatta roll. It has 738 calories, 332 calories from fat, 35 grams total fat, 9 grams saturated fat, 1 gram trans fat, 86 mg cholesterol, 1881 mg sodium, 64 grams carbohydrates, 3 grams fiber, 3 grams sugars, 31 grams protein. The French Dib & Swiss Toasted Sub (bottom right) features roast beef and melted Swiss cheese on a toasted ciabatta roll, served with a side of au jus for dipping. It has 621 calories, 181 calories from fat, 19 grams fat, 7 grams sat-fat, 1.5 grams trans fat, 79 mg cholesterol, 3397 mg sodium, 68 grams carbs, 3 grams fiber, 2 grams sugars, 37 grams protein. The Classic Italian Toasted Sub (top right) has ham, salami, pepperoni, melted mozzarella cheese, banana peppers and garlic mayonnaise, topped with lettuce, tomatoes and red onion and drizzled with red wine vinaigrette, on a toasted ciabatta roll. It has 827 calories, 410 calories from fat, 45 grams total fat, 13 grams sat fat, .5 grams trans fat, 89 mg cholesterol, 2495 mg sodium, 69 grams carbs, 2 grams fiber, 4 grams sugar. And the Turkey Bacon Club Toasted Sub (bottom left) features thinly sliced turkey breast, melted Swiss cheese, chopped pepper bacon and herbed mayonnaise on a toasted ciabatta roll, finished with lettuce, tomatoes and red onion. It has 619 calories, 159 calories from fat, 17 grams total fat, 5 grams saturated fat, no trans fat, 81 mg cholesterol, 2052 mg sodium, 66 grams carbohydrates, 2 grams fiber, 3 grams sugars, 41 grams protein.